Well, we started packing on Sunday, and on Friday we were all unloaded in our new house. We're about halfway done unpacking...more than halfway, maybe? The kitchen and baby's room are done, so I'm happy. Our moving success can be attributed to: 1. My husband's packing ability and speed. 2. Lot's of help from friends loading and unloading 3. Family in town to help unpack/snuggle the munchkin while we unpack. Needless to say, I'm pretty tired. And it's about now that the emotional component of moving is hitting me. But, overall, this has been one of our least stressful moves. Yay! 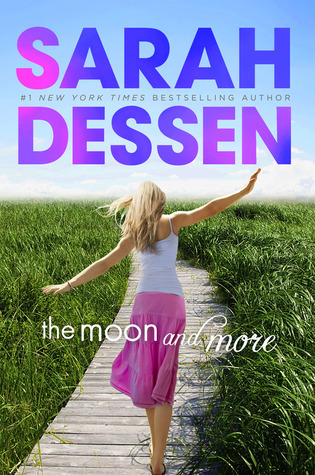 And bonus: I finished reading a lovely Sarah Dessen book: The Moon and More. It's a story about that summer between high school and "after." In true Dessen form, her characters and relationships ring true, and the beach town of Colby comes to life (it really made me miss the beach). There's friendship, complicated family dynamics, first love, and a summer rebound romance. This past week me and the Little have been hanging out at Nana and Grandpapa's house while the hubby's been a counselor at camp. It's been a great kind of vacation -- lots of just hanging out, playing, and reading. Even though I've been doing a little bit of work, and of course taking care of the Little, there's no housework or cooking or life stuff hanging over my head (now, when we get back...that's another story. Three words: packing and moving). So I managed to breeze my way through The Silkworm, by Robert Galbraith (a.k.a. J.K. Rowling) in a way that is reminiscent of "previously." It's been a nice breather, and a reminder that it is possible to find time to read with a new baby...you just have to make that choice and adjust your expectations -- it is less time, after all. (there was a great post on Book Riot about this a few weeks ago). Anyway, The Silkworm was another solid installment in Galbraith/Rowling's new detective series. It was almost too gory for me, but not so much that I couldn't keep reading. Another tight plot, character growth, and more of Rowling's brilliant descriptions (you meant I'm not in London in the middle of winter? Darn it). That woman knows how to turn a phrase. The premier of the new Disney show Girl Meets World (I haven't seen it...since I don't have cable and haven't managed to find it streaming anywhere yet) has got me thinking about it's predecessor. I was a huge fan of Boy Meets World. The show ran during my junior high, high school, and early college years. I remember watching the series finale with my friends Lesley, Katie, and Kristy -- I didn't cry at the end, but it was definitely a bittersweet moment. The end to a piece of my adolescence, marking the passing of time the way the finale of The Cosby Show seemed to mark the end of my childhood. Something about these two shows just clicked with me. It's funny how some stories seem to do that -- be it television shows, books, or movies. There's something about them that feels real, and while other stories can be wonderful, entertaining, and moving, there's nothing like a story that gets inside and becomes part of your history. The Ramona Books, Little House on the Prairie, and the Anne of Green Gables series are all books that definitely fall into that category for me as well. There's nothing like finding a friend like that. And on a related note...anyone who watched Girl Meets World have an opinion? I'm a little scared, I have to admit. Part of me wants to stay away. Old seasons of Top Chef on HuluPlus. I love Top Chef! It's something I can (personally) watch and not pay super close attention to, which is good for my during-the-day-taking-care-of-a-baby-or-writing-or-housework activities. Top Chef is my favorite cooking competition show because the drama is relatively low, the cooking is fancy, and it feels like the perfect blend of education and entertainment. Star Trek: The Next Generation. I'm on the final season of TNG, having started re-watching the series about a year ago. It started out as something to do while working on a big knitting project, and ended up as one of my I-want-to-watch-something-but-nothing-new-is-on shows. TNG always makes me think of my Trekkie Dad -- it was a show we watched together while I was growing up, and when he's visiting he's always game to watch an episode or two. I love how the show just gets better and better over time (with a few exceptions each season, of course), and the actors really grow into their roles so well. It's the cast that really makes the show, in my opinion. And watching TNG is always fun for a little pop culture nostalgia. You can always tell what the hot-button social or political issue is at the time. I picked up The Book of Three on the suggestion of my husband, who had enjoyed the Chronicles of Prydain series as a kid. In a Welsh-inspired land, an Assistant Pig-Keeper longs for adventure and the chance to be a hero. When he loses his pig (who happens to be an oracle), he gets even more adventure than he bargained for. As he tries to find his oracular pig before the pig falls into the hands of an evil king who threatens Prydain, he meets a strange and loyal creature, a king-turned bard, a real-life hero, an evil sorceress, and a sassy princess. He faces fears, makes friends, and learns that heroism isn't exactly what he thought it was. I liked The Book of Three, and am currently enjoying the rest of the Chronicles of Prydain. It's classic quest fantasy, and although there are no real surprises or twists, it's classic done well. I appreciate that the characters grow throughout the story and series as a whole, although a few of the "lessons" that Taran learns are a bit "lessony." There's a whimsy to the books that I enjoyed as well, and I think they'd be great books for a family to read aloud together. They are definitely books I'd hand off to kids looking for fantasy, and as an adult it's an easy, comfort-food kind of experience. Bottom line: a solid, Welsh-flavored, children's fantasy story. I would like to share the everyone's-a-soccer/futbol-fan-when-national-pride-is-on-the-line-but-we-watch-soccer-year-round-at-my-house experience this afternoon over a pint with a crowd of fans somewhere...but a cup of coffee, my couch, and my best girl (she's only two months old...somehow I think the crowd and the pint might be a bit overstimulating) sounds better anyway. Sometimes I find it easy to pick up a book wherever, whenever. I don't need a special drink or a certain chair or specific music. On a train, in line, flopped on my couch, sitting outside on a park bench, eating lunch...wherever, whenever. Sometimes, environment really enhances the experience. Give me my cozy blanket, a cup of coffee or tea, and some mood music, please. I can curl up and suddenly the day is gone. Lately, I'm finding the biggest barrier to how much reading I'm doing is not environment, or even the new Peanut in our house (at least not directly). It's the never ending to-do list, and the feeling that if I have a spare minute I should be "doing" something. But you know what, there's room for everything, and my to-do list will always be there. I just need to remember that.